Market 707 – At Dundas Street West and Bathurst, there is a savory scent in the air. Following the smell, you will find Gushi, a food stall that sells kushikatsu, one of the popular street foods in Japan. The stall, which looks like a flipped shipping container, serves food made with a combination of pork, quail egg, onion, and okra that are deep fried. Gushi’s original secret sauce makes for a mouth watering experience, and when you take just a bite of the kushikatsu, you can’t help but smile. Gushi’s owner is Mr. Shinji Yamaguchi. We spoke to him and were surprised to hear what he had to say. While in Japan, Yamaguchi was the Japanese champion of the machine assembly section of the WorldSkills Competition. Machine assembly requires precision to one thousandth of a millimeter by using just a file. He aimed to become a world champion. He kept training his skills and won the Japanese championship that followed the world championship; however, since he became a Japanese champion, the world championship has never been held. The problem is that there haven’t been enough competitors in the machine assembly section. His dream fell apart, but he wasn’t heartbroken. He pursued a new dream to set up his own business, which he had been interested in since he was a high school student. 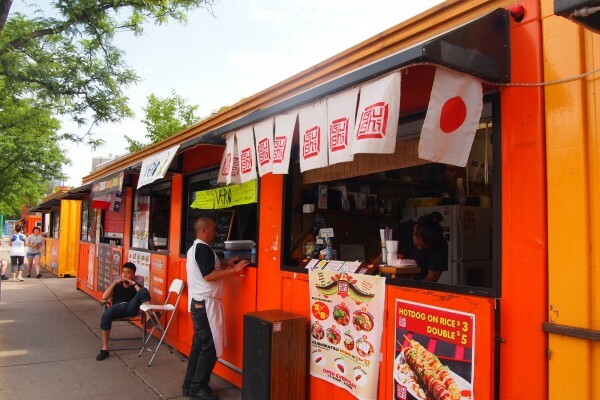 When we asked him why he chose Toronto to set up his business he said, “I called an agency with my strong desire to go abroad and they told me that Toronto was the hottest place in the world.” He decided to manage a kushikatsu restaurant because he loves kushikatsu. However, he wasn’t able to open Gushi right away when he came to Toronto. Since he didn’t have any experience in the culinary arts, he began an apprenticeship to learn the ways of the bartenders and chefs at Toronto restaurants. He also did an internship in order to learn yakitori, one of the traditional Japanese cuisine. And finally, after completing his training, he became the business manager and chef of Gushi. Shinji Yamaguchi at the Nikkei Voice Sake and Sushi Night. Photo by: Scott Kawaguchi. From his experience at the event, Yamaguchi learned a valuable lesson. “No matter how delicious food we prepare, there are a lot of things that we can’t figure out until the food goes into the customers’ mouth,” he said. In July of the same year, he acquired an empty ‘shipping container’ at Market 707 and on August 3rd he opened Gushi. There is a reason why he opened Gushi on this date. “I like the number 3, or, rather, my lucky number is 3,” he said. Almost a year has been passed since. Looking back, he has learned the importance of taking that first step. What Yamaguchi brings to Gushi, as he told us, is “love, rather than food.” He thinks that the true business is not only about seeking a personal profit, but providing more than enough satisfaction to customers. “I’d love to surprise customers by preparing kushikatsu that is more reasonable and delicious than they expect… Gushi is not ‘fine dining.’ It is ‘fun dining!’,” he said with a smile on his face. Everyone knows that the No. 1 street food in Toronto is the hot dog, but Gushi wants to reach higher. “Gushi aspires to becoming a king of street food. I want people to say that they can’t talk about street food without knowing Gushi,” Yamaguchi said. 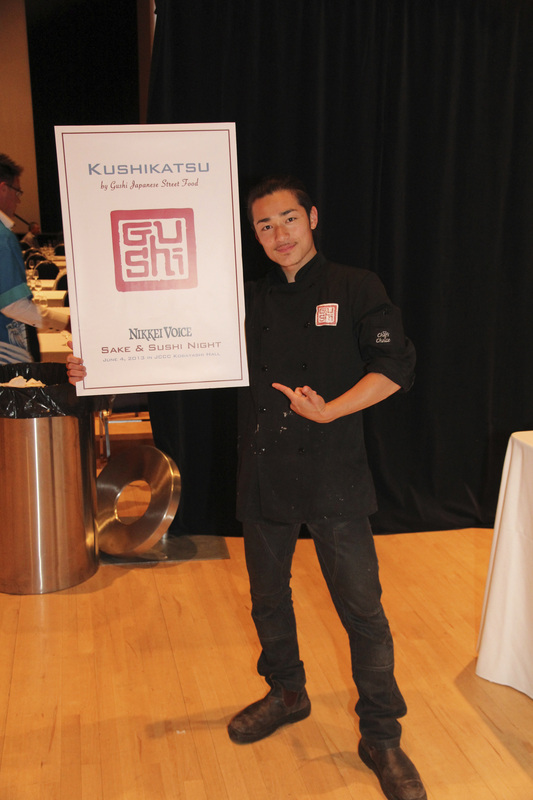 On June 4th, Gushi was a food vendor for Nikkei Voice’s Sake and Sushi Night. And while he was busy in the kitchen, he said he appreciated that he was invited to participate in the event. Gushi also sold its kushikatsu at the JCCC’s Natsu Matsuri/Obon Festival on July 13th, the Night Market by T&T Supermarket from July 19th to 21st, and Matsuri by Kurakake Company on July 28th. He holds an event at Gushi on every second Friday as well. According to Mr. Yamaguchi, he is going to put a lid on selling kushikatsu at Gushi at the end of July, though his stall will remain open to sell a number of other tasty Japanese foods like his signature Karaage chicken. So if you want to enjoy his kushikatsu, while it’s still on the menu, visit Market 707 soon. Oh no! Only one week left D: I have to get more Gushi ASAP.